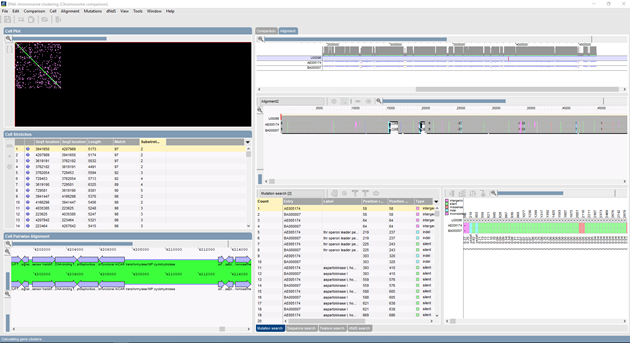 BioNumerics lets you align and compare sequences of up to full chromosome length. With these comparative genomics tools, discontinuous alignments are calculated using seed and stretch-based sequence mapping, revealing genomic inversions, swaps, duplications, insertions and deletions. Mutation and SNP discovery can be performed on template-based multiple chromosome alignments, with optional selection of mutation type (intergenic, synonymous, non-synonymous or indel) and filtering of significant SNPs based on quality scores. dNdS analysis based on the ratio synonymous/non-synonymous mutations within gene clusters is available to predict evolutionary selection pressure on genes. Extremely fast pairwise matching and alignment of N×N sequences of full chromosome size. 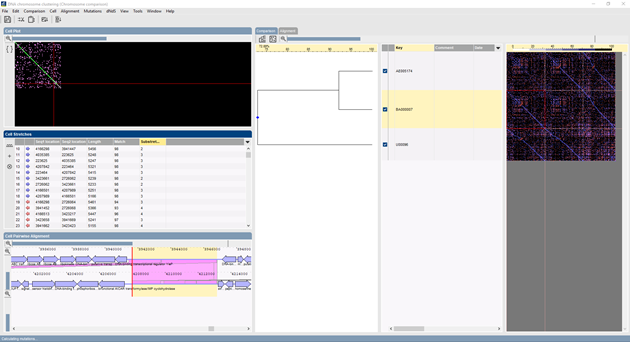 Seed and stretch based sequence matching, allowing for discontinuous alignments, including inversions, swaps, duplications, insertions and deletions. Full-sequence based or coding sequence based alignment, using user-defined nucleic acid seeds and/or amino acid seeds. Display of clickable N×N chromosome similarity matrix and associated clustering. The selected pair of chromosomes is displayed in the dot plot Cell panel. Direct and inverted matches are displayed in different color. Clickable dot plot matrix, updating (1) currently selected stretch in the Stretches panel and (2) associated alignment in the Pairwise alignment panel. Calculation of superstreches, i.e. larger clusters of stretches that contain no major discontinuities and that have a minimal overall homology. Alignment of multiple chromosomes based upon selected template chromosome. Display of overview panel and detailed multiple alignment panel. Synchronized selection in overview, multiple alignment, dot plot, stretches and pairwise alignment panels. Versatile search and display functions for features and subsequences on multiple chromosomes. Search and display of mutations within multiple alignments, with discrimination between intergenic, synonymous, non-synonymous and Indel mutations. Additional filtering based on SNP quality scores. 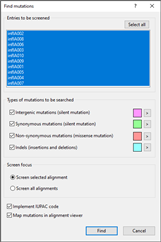 Display colors based on mutation type or quality; sorting based on position, gene, NA change, AA change, quality (see figure above, Mutation analysis panel). Direct clustering based upon mutations or export of mutation list for further analysis. The dNdS ratio for a gene compares the non-synonymous mutations versus the synonymous mutations and as such, provides information on the positive selection pressure of the gene. The starting point in BioNumerics is a template-based multiple chromosome alignment. For each ORF on the template sequence, the aligned ORFs on the other sequences (if any) are grouped and synonymous/non-synonymous mutations are calculated for each codon. A list of dNdS ratios and related parameters for all ORFs is calculated, and the dNdS ratios can optionally be plotted in differential color on the multiple alignment.